SEALINE - South African Angling and Boating Community > General Angling Topics > Saltwater Fishing > How to read the surf and identify sandbanks? I went down to the coast for the weekend and fished at Umkomaas on Saturday morning, normally I catch fish whenever I go down there but this time I caught absolutely nothing.Only got a few small bites. I think was down to the surf being quite clean. So it got me thinking that if I can a least read the surf to see if the fish will be on the bite, it would help elminate fruitless fishing trips like this. Also I see alot about fishing the sandbank, how do I identify a sandbank at a fishing spot I have never fished before or even one I have fished before? I'm no expert but on google earth I have noticed that a break in the surf usually indicate a rip and hence a deeper channel running out. on the upstream side parallel to the beach, the channel is usually deepest just before it turns and joins the rip away from the beach. I have since observed and verified this in real life as well. I think the key is to try and identify the rips going out to sea and either fishing into it or just to the edge of it. You can also identify rips by slightly more choppy water whish is often discolored. Hope this helps - I am not a shore fisherman really! Thanks, I appreciate the advise/help. I will certainly keep an eye out for this. It varies from place to place, First try find the vivble sandbanks, see wahat the water does and look for the same pattern even if you cant physically see it. There's an excellent book (with pics) called Secrets of the Sea by Nickie Lourens that goes into detail about reading the sea/water. Thanks guys for the informative replies. Your advice/help is definitely appreciated. I have also being doing a bit of research online and most of the resources I could find, explain that fishing the break in the sandbank is the place most likely to produce the big fish. Is this indeed true? Yes this will be the area the fish enter and exit through, so at the beginning and ending of tides the chances will be good getting fish here. If possilble work the entire area and see where you get best results, dont just stay at one place. The best way to ever understand the action of water is to watch the water on a reef area at a specific tide and see how the water work and then the next day dive that same area. Seeing the water action on the surface and then seeing the underwater structure allows one to superimpose the 2 and gives an above and below picture. 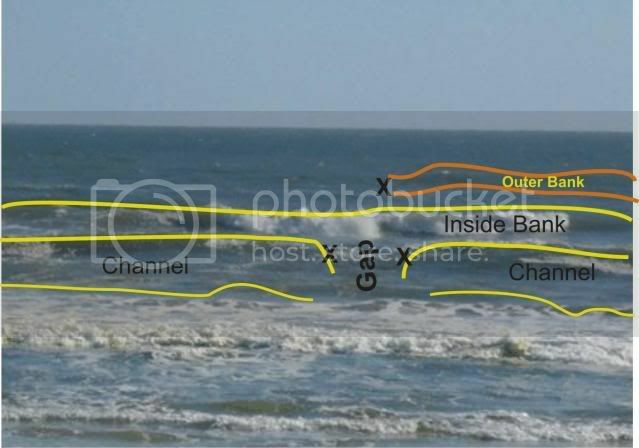 Once you have this image cleared then reading wave action when you are at a new area is so much easier and more logical. I spent my whole youth either diving, surfing or fishing and I dived many of the spots I surfed so it helped me gain a total grasp of how a reef or sand bank causes water to work. Different species also relate differently to sand banks and the tide to fish the bank also differs. For example the granter and steenbras species are on the banks at high tide feeding on molluscs and crustaceans. There are also many small fish in amongst them feeding on small bits of food stirred up on the banks. Here is a link to some information. For fishing from a sand beach onto sand, what you are looking for is the formation and breaks in sandbanks and rip currents that form when the water from shore break waves is carried back out into the surf. The formation of and gaps in sandbanks result in changes in current as swells as the tides move over them. In some places reading the surf is easier as because there are surface signs of the underlying currents. 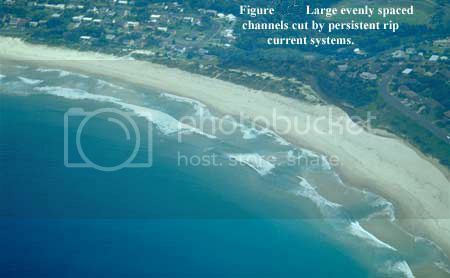 It is far easier to read the beach structure at low tide, as the water depth is lower and swells break further from the shore, or often, in the case of multiple roughly parallel gutters and banks, the waves will break more than once and over the troughs they will reform into swells. 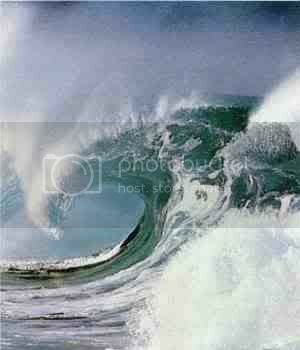 When a wave jacks up and breaks, it is because the water is shallower than the depth of the wave. A wave is a form of energy and as high as the swell is above the water it is preceded (in front of) by another wave off energy traveling below the water. As this lower wave comes into contact with the bottom of the beach it is slowed and the surface energy wave starts to overtake it and this causes the wave to crest and break. The more sudden the change in depth, for example a rock reef the quicker the bottom wave of energy is slowed and its energy and water is welled upwards causing the wave (in surfing terms) to Jack up suddenly and break quicker and throw the lip over. 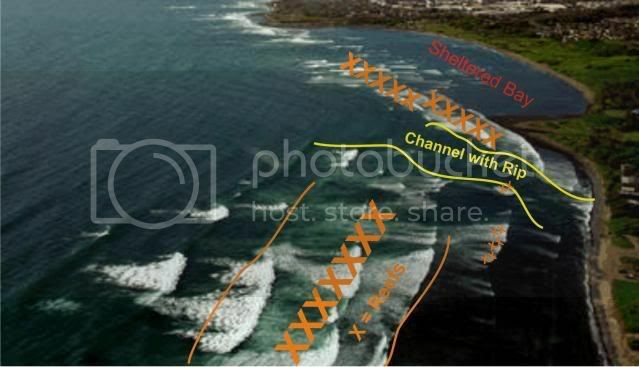 A gap in the sandbank would be more clearly indicated on the same swell that was breaking in a particular section, by a section of the swell that was not breaking as aggressively or not breaking at all. This would be the case when the bottom depth is too great to force the swell to fold over. In other words, where the swell broke cleanly, the depth would be shallower than where that same swell did not break as cleanly or not at all. Where it did not break as cleanly, a gap in the Sandbank exists. When the tide is higher, the water depth may be too deep to actually force swells to break as they pass over the sandbank. Instead, swells will peak as they pass over a more pronounced section of a sandbank, with the same swell not peaking at all or to a lesser degree where a trough or gap is present. The presence of sandbanks can also be detected by looking for colour or upwelling of sand in the water, this is easier in clearer water or water with less sand hanging within it. The shallow areas appear beige (the color of the sand) with the deeper areas appearing greener or bluer. It is also important to be able to determine the presence of troughs. Troughs are the sections of deep water that are present between sandbanks or between the sandbanks and the beach itself. These troughs can be seen a rolling breaking wave reforms after is has broken over a bank. Usually the swell that reforms is of much smaller than it was before it broke over the bank because much of it’s energy was lost when the preceding lower wave of energy hit the sandbank. 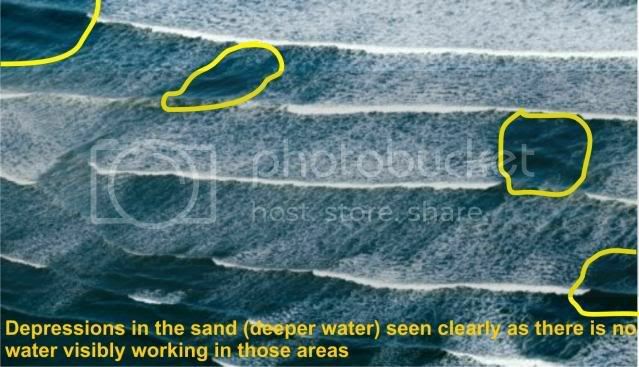 At higher tide stages, the waves may not actually break on the sandbank, but will peak to make them more obvious, with the swell being substantially smaller or apparently nonexistent in the trough. 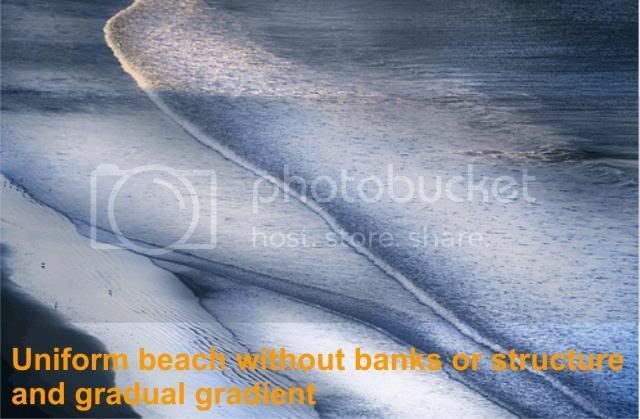 Because the trough is less affected by the preceding wave energy the bottom is not stirred up and appears clearer or bluer than where the sandbank is. There is also a lot less white foam over the trough area. 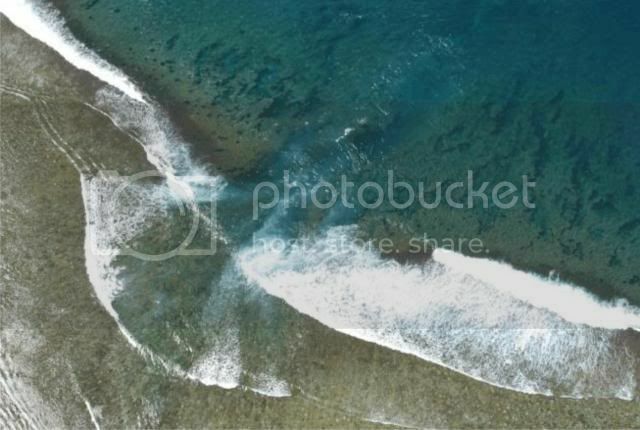 A rip is formed when the shore break crashes on the beach and the backwash is concentrated into a v-shaped funnel. Normally, the breaking wave water and the backwash ebb and flow evenly, but sometimes, water ebbing from the south will flow to the north where it will collide with water flowing from the north to the south forming a dam of water that will be forced back out to sea. These two bodies of water have a higher mass and flow out to sea with much greater speed and as always in nature they will choose the path of least resistance and this will be where there is a deeper channel leading out to sea. If there isn’t a channel this rip will cut a path out of the sandbanks to reset the equilibrium. The rip that is now plowing through the sandbank acts as nature’s bulldozer exposing all manner off food as it destroys the sea bottom and is always an area where feeding fish can be found. The food picked up by this rip will gather in eddies that are normally found where a sandbank is adjacent to the deep troughs and the rip. The rips will be more prevalent at high tides and although present at low tides they are normally a long way out. 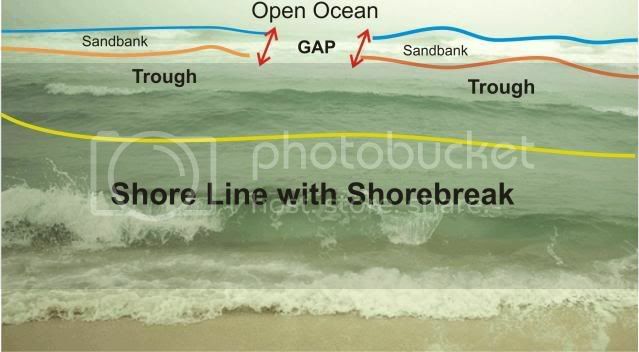 Often when there are no sandbars, the shore break is very severe, causing a deep and abrupt drop-off immediately behind the shore break. When there are no sandbanks, the energy of swells is not at all dissipated until they reach the shoreline, resulting in powerful and violently breaking waves that literally pummel and paralyze baitfish and break clams. Fish, in particular Steenbras and Kob in the South or Pompano and Kingfish in the North, often swim tight to the beach to take advantage of this situation. Accordingly, casting out as far as you can is not always the best option. It is important to remember that both the formation and destruction of beach structure is caused by the wind and swells that are in constant motion and change. Accordingly beach structure is always changing, and a spot that held fish one morning may not hold fish the next as the structure may have changed. A good tip is to check the surf at low tide, and come back to fish the last end of the incoming at spots you marked at low tide with above the high tide mark or on a handheld GPS. Thanx - learn something new! Also check this excellent section by neil g in the saltwater lure fishing section. Part 3 of his dissertation- reading a location. Favorite Fishing Spot: Plett, Natures Vally, Kanon, Cape Infanta Keurbooms strand, Reebok-Kleinbrak, Danabaai! Simen wrote: Great post there Enigma! One thing to always remember is that reading the water is not only important when looking for places where the fish might be holding. Understanding what is below the water by reading the surface action can help you to land a fish or prevent it from cutting you off on a reef.